If your dog is vomiting yellow foam or slime, it makes sense that you’re worried. Did she get into something poisonous? Does she have a stomach bug? Should you take her to the vet? In most cases, a dog throwing up isn’t anything to be concerned about. There are, however, some circumstances you should watch out for to make sure your dog is okay. 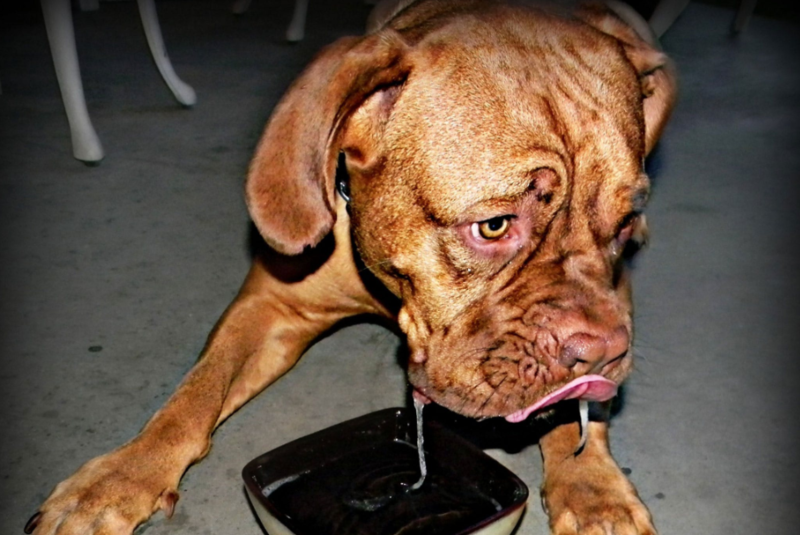 Why Is Your Dog Vomiting Yellow Foam or Bile? 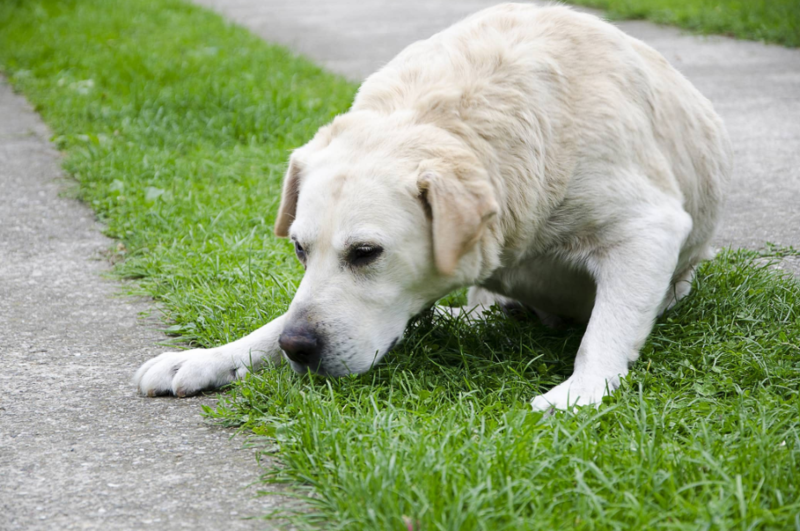 Is Your Dog Vomiting Yellow Bile and Lethargic? Is Your Dog Vomiting Yellow and Not Eating? Is Your Pregnant Dog Vomiting Yellow Foam or Bile? Dogs eat a lot, in terms of both quantity and frequency. Most dog owners have to keep anything out of reach that even halfway resembles or whiffs of food like potted plants, empty chip bags, and stinky garbage cans. Try as you might, your dog is bound to get into some forbidden “food” at some point – and it probably isn’t going to agree with his tummy. If you’ve got a dog vomiting yellow on your hands, this likely means his stomach is empty and there isn’t anything left to puke besides bile which is yellow. Think back to a time when you puked so much you couldn’t puke anymore – you probably threw up that bitter-tasting yellow bile right? It might have been foam or heavy slime. Either way, this meant that your stomach was empty but your body still felt the need to throw up. That’s what your poor little dog is going through. If your dog just threw up yellow bile and later started eating, drinking water, and behaving normally, there’s probably nothing to worry about. Just keep an eye on her eating, drinking, and pooping habits for a few days. If the vomiting continues, however, it might be time to see a vet. Aside from the obvious empty stomach, here are a few reasons your dog might be throwing up that lovely yellow bile. Just like humans, dogs can develop a food allergy at any time. Monitor her diet and try A/B testing common food allergens like dairy or wheat. If a non-food item is blocking your dog’s intestinal tract, he’ll probably keep vomiting bile. This is an emergency that requires surgery so head to the vet. Some dogs may be sensitive to high-fat or oily foods. What did you feed him last? Avoid fatty foods like bacon or cheese and see if the vomiting subsides. Vomiting bile could be a symptom of several GI conditions including ulcers, IBS, cancers, and heartburn. With this condition, bile leaks into the stomach. Bilious vomiting syndrome is usually caused by overeating or eating fatty foods. Try splitting up your dog’s meals into smaller servings. If your dog is vomiting yellow bile and lethargic this could indicate a more serious problem is going on behind the scenes. Unfortunately, we can’t diagnose the problem online, so you’d have to take her to the vet. Vomiting and lethargy are two very vague symptoms that could indicate a broad range of semi-serious to life-threatening conditions – so don’t freak out just yet. Just get your dog to the vet. If a human was lethargic and vomiting, you would have no idea what’s wrong unless they could explain their symptoms, right? Well, your dog can't tell you he feels like garbage because he ate that mysterious plant or dead mouse in the backyard, so the responsibility is on you. Lethargy is always a red flag that something more sinister is going on that your dog can’t tell you about. It makes sense that your dog might not want to eat if her stomach is bothering her. Do you have a hankering for pizza when you can’t keep any food or water down? Well, your dog doesn’t either. In fact, if your dog is vomiting yellow, experts recommend doing some controlled fasting to help your pup rebuild her stomach lining. Withhold food for 12 to 24 hours to give your dog’s stomach and intestines a break. 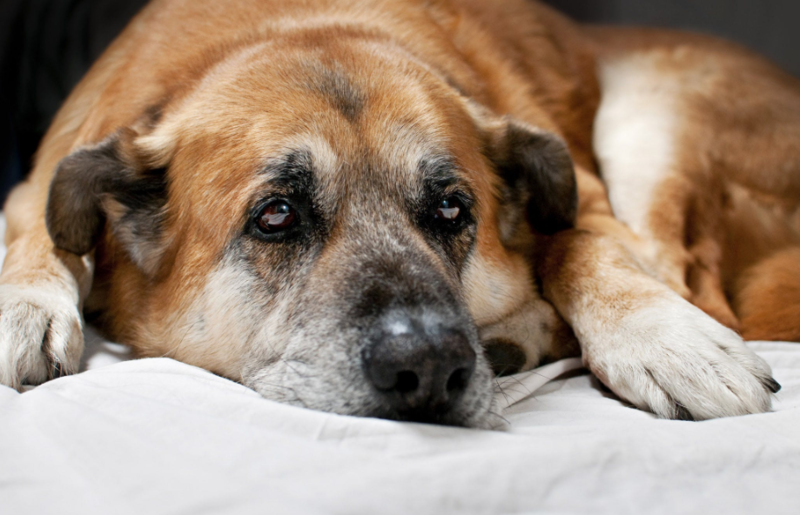 If your dog still won’t eat or continues throwing up, then it’s probably time to see a vet. Keep an eye on your dog’s current stress levels and environment. Just like humans, dogs might throw up or stop eating when they’re suffering from anxiety or high levels of stress. Did you just move or introduce a new animal into the house? Have you just returned from a trip? If your dog’s environment has significantly changed anytime recently, stress might be the culprit. In fact, dogs are particularly vulnerable to anorexia in stressful situations. No, she isn't traumatized by unrealistic beauty standards but unusual changes might make her want to avoid food. It’s hard to tell what’s going on if your pregnant dog is vomiting yellow foam or bile. If something seems off, it’s time to see the vet taking care of her prenatal needs. How far along is your dog? Vomiting is sometimes a sign of labor in dogs because their instinct knows it’s best to have an empty stomach. Look for other signs like restlessness, nesting with towels or blankets, pacing back and forth, and panting. If she’s just throwing up and you don’t notice any other alarming symptoms like lethargy, try giving her some easy-to-digest food like chicken and rice. Give her a comfy place to relax and gain back some strength. If she still won’t eat or hold down food for several days, a trip to the vet is likely in order. 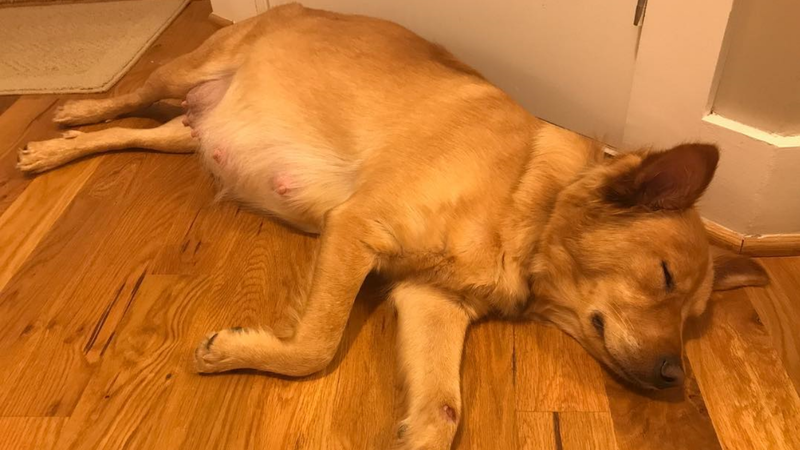 It’s always better to be safe than sorry when a pregnant pup is concerned. Vomiting isn’t necessarily something to be concerned about on its own. If you took your dog to the vet every time they threw up - you’d spend a fortune in medical bills for virtually nothing. It’s important to understand the other red flags that could indicate something is seriously wrong. Any of the symptoms below (as well as persistent vomiting) might mean your dog’s body is trying to tell you something about his health. Rapid weight loss: Unusual weight loss or any weight loss of 10% or more could mean your dog has some kind of stomach problem (unless you’re actively trying to help your dog drop a few pounds). 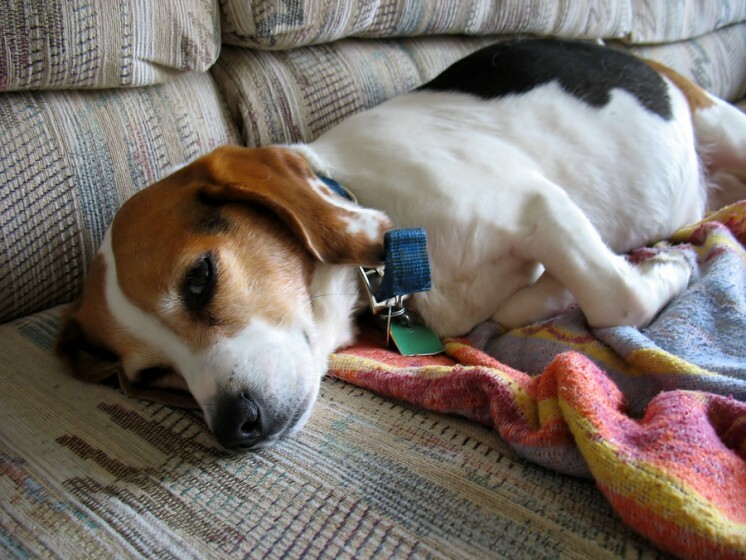 Lethargy or inactivity: Just like people, dogs have days where they feel tired. 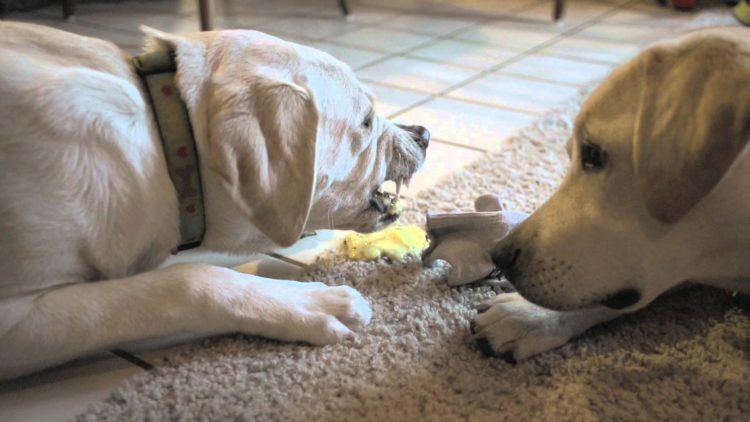 Any behavioral changes that last more than 24 hours, however, could mean your dog is trying to tell you something. High temperature: Anything outside 100.5 to 102.5 is abnormal for dogs. Get to a vet or hospital. Shortness of breath: Excessive panting or trouble breathing could indicate respiratory or cardiovascular problems. Blood: Look for blood in vomit, urine, and feces. Blood in any excretion is always a symptom to take seriously and even a small amount in one instance warrants a trip to the vet for tests. 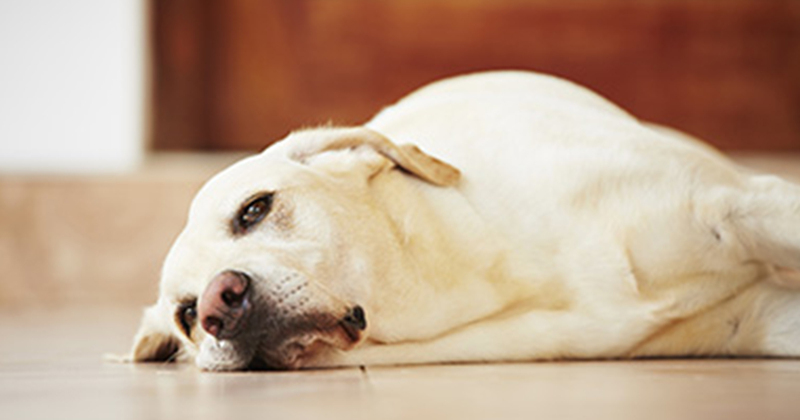 Persistent diarrhea: Your dog could be dehydrated or suffering from a stomach bug. Fainting: This could be a symptom of a broad range of issues including respiratory problems, musculoskeletal problems, and central nervous system conditions. Eye problems: Red eyes, persistent eye crust, or yellowing eyes can all mean different – yet serious – problems. Coughing: Your dog should never cough. This is often a sign of bacterial or viral respiratory infections. It could also mean his airway is blocked but don’t reach in your dog’s mouth – you could push the blockage down further. Bloating: If your dog’s stomach looks bloated or feels tender, this could indicate a serious digestive problem. Your dog probably won’t let you touch his tummy if he’s in pain – that's a sign. 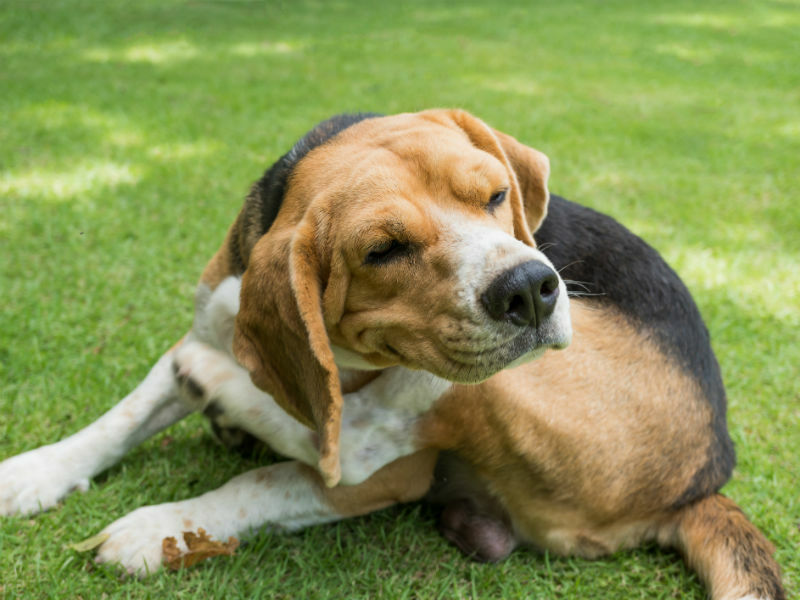 Behavioral changes: Does your dog look like she’s in pain? Is she whimpering, retching, or hiding? Is she pacing back and forth? 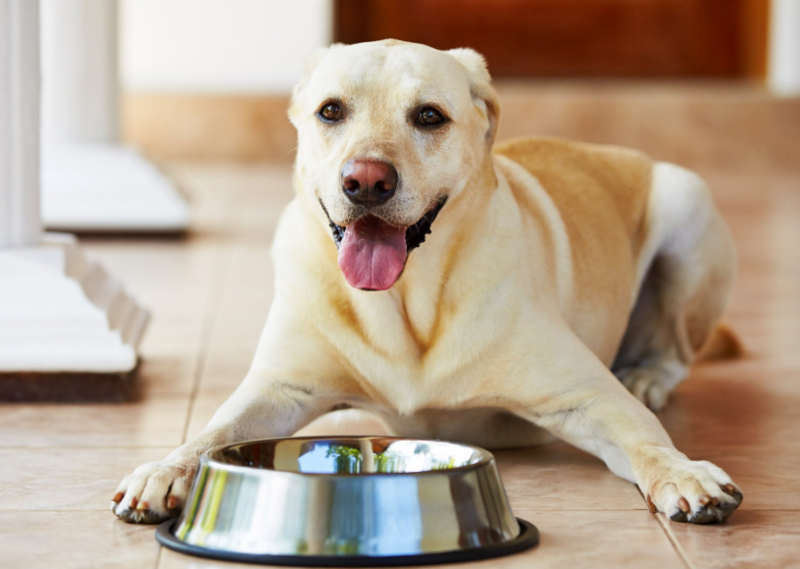 Does your dog sit next to her food dish but avoid eating? In all of these cases, she’s trying to tell you something. 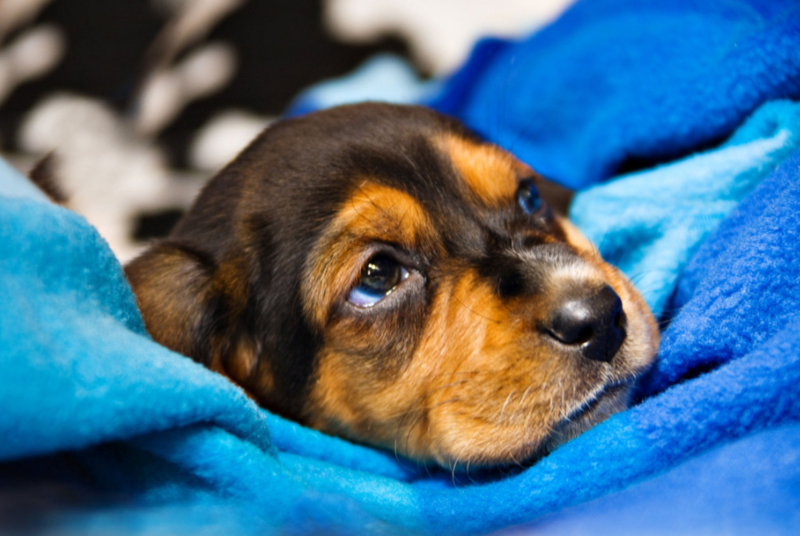 If your dog is experiencing any of the red flags above, get him or her to a vet immediately.